Fortunately for Bulls, none of this matters. 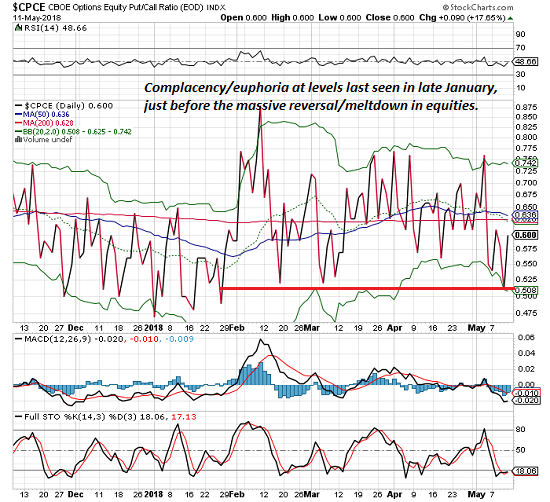 A relatively reliable measure of complacency/euphoria in the stock market just hit levels last seen in late January, just before stocks reversed in a massive meltdown, surprising all the complacent/euphoric Bulls. The measure is the put-call ratio in equities. Since this time is different, and the market is guaranteed to roar to new all-time highs, we can ignore this (of course). 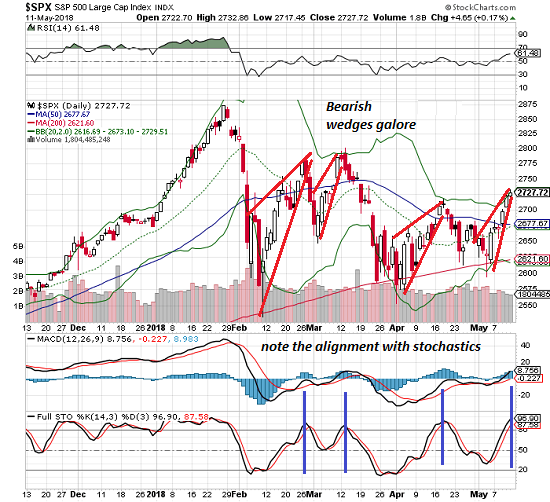 Two of the more reliable technical patterns are falling/rising wedges, also known as descending/ascending wedges or triangles. 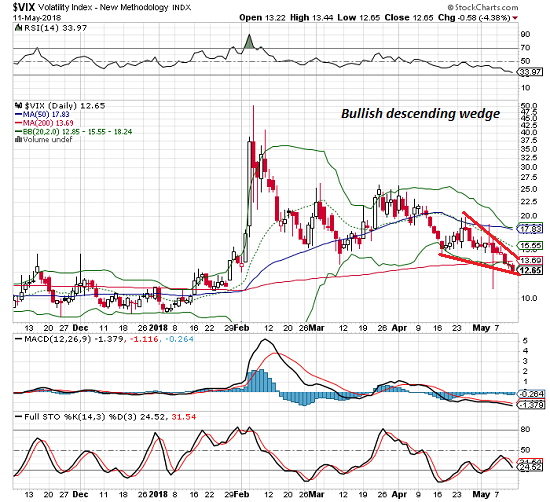 Ascending wedges are bearish, descending wedges are bullish. But a funny thing happened on the way to market complacency/euphoria this year: every "this time is different" manic rally in the S&P 500 (SPX) formed a bearish rising wedge which promptly reversed once the pattern peaked. Fortunately for Bulls, none of this matters. Fundamentals trump technicals (heh), and since profits are soaring while wages stagnate (funny how that works, isn't it? ), higher oil prices mean something or other that's positive (it can't be higher gasoline prices are good, can it? Must be something else), Facebook has recovered from its temporary swoon and the Fed is easing or tightening or doing whatever it's doing, so it's a clean sweep: the fundamentals are all rip-roaring good. Oh wait a minute--technicals do matter--when they support the Bullish case.The descending trendline from the January highs was just broken to the upside, a clear technical signal that new all-time highs are essentially guaranteed--not later this year, but this month--maybe this week, so buy buy buy, you snooze you lose, don't fight the Fed, etc. (insert your Bullish aphorism of choice). Even more compelling (if that's even possible), the quatloo-bat guano ratio just flashed a huge buy signal, something that only happens on 1.3% of trading days since 1968, so let me repeat: BUY BUY BUY (repeat your Bullish aphorism of choice). Thank you, Charles M. ($50), for your stupendously generous contribution to this site -- I am greatly honored by your steadfast support and readership. Thank you, George H. ($5/month), for your monumentally generous pledge to this site -- I am greatly honored by your support and readership.